Once a habitat for all the animals figured in the constellations of the zodiac, Armenia lost several years ago (the Asian lion and Caucasian tiger are found only in zoos). As recently as 20 years ago, the environment supported large groups of bears, leopards, deer, gazelle, Caucasian bearded goat and wild ram, all of which are now on the brink of extinction. Historically, Armenia has experienced low human population densities and regulated use of natural resources which acted as a balance for ecosystems in Armenia. However, over the last 1,000 years human impacts on the land have increased, mainly through deforestation and increased use of pastures. This intensified over recent decades with unprecedented population growth and urbanization beginning around 1920, resulting in increased human impacts not only on individual species, but also on whole ecosystems. Climate change An impact of pollution on the natural environment is increasingly being proved to directly affect global warming. Increases of 2-3+ C (4-6+ F) are predicted for Armenia�s climate. IN this areas that equates to a decline in rainfall, resulting in increased risks of desertification. This is likely to severely affect wetland habitats and associated species, while changes in the distribution of habitats may affect the range and viability of a number of species. Pastures represent around half the agricultural land, and have been severely degraded by overgrazing. Over the last 70 years, there has been increased conversion of semi-desert, steppe and wetland habitats for cultivation, resulting in the loss of some important sites, and increased threats to species. Caucasian Bearded Goat: (capra aegagrus F. rxl.) Listed in the Red Book for endangered species, the Caucasian Bearded Goat inhabits rocky mountains between altitude 2000-3900 meters. Their main habitat is in the Khosrov Nature Preserve and the mountains of Vayots Dzor. The Caucasian Bearded Goat population has decreased dramatically, from about 700 in 1970 to no more than 70 or 80 today. The decrease in population is due to illegal poaching and agricultural development into their natural environment, and preservation depends on breeding and artificial insemination in carefully controlled environs. Caucasian Bearded Goats can also be found in Israel, the mountains of Syria and Anatolia. Armenian Muflon (ovis ammon gmelin Blyth). Endangered Species listed in the Red Book. In 1970 there were between 200-400, now there are only 42 known alive. 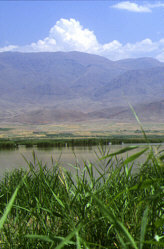 Habitat is the Khosrov Preserve, and they live between 800-3900 meters altitude. They live on mountain slopes and on mountain field plateaus. The sheep are endangered because of illegal poaching and the development of agriculture in Armenia. Preservation depends on artificial insemination in carefully controlled environments for later release. Leopard (panthera pardus tullianus), lives in mountain forests and high altitude canyons. There are no more than 25 leopards in Armenia, due to encroachment and illegal hunting in their environment. The primary cause has not been encroachment (Armenia's population has actually contracted in the last 10 years) but illegal poaching by the local population. Hunting tours are more comon then they should be in Armenia, and repeated abuses by the military taking helicoptor hunting expeditoins into protected areas do little to help, even if it is perception only. Rare sightings have been reported in nature preserves and the more remote areas of the country. It is possible to take special-guided hikes into the regions where they live. There are a remarkable number of Eco-Associations in Armenia (see Eco-Groups), but so few seem to be actaully doing anything to prevent further deterioration. Evenm the vaunted Greens have been embroiled in political in-fighting and struggles with an innefectual Ministry of Ecology, losing the focus and determination that vaunted it to the forefront of Armenia's consciousness when it helped organize opposition to pollution after Chernobyl. The fact remains, that while no one wants to lose these precious assets, Armenia's flora, fauna and environment are taking second place to the struggle to live. Even well-publicized projects from the UNEP, USAID, WORLD BANK and others appear to pour money into a black hole, with little or no results to show for a lot of money and consultant's time. Perhaps that is where the money goes--into western consultant's pocket. It certainly is not apparent in any protection or reversal of specieis population decline. And there is time. The departure of up to 1 million people in the last ten years has had the unseen consequence of decreasing pressure on the environment, but as the economy improves, more pressure will come. The typical Armenian inside Armenia actually shows more understanding of the consequences of what they do then those in the Diaspora, which don't even have a record for conservation, let alone understanding. It will be up to local Armenians to repair and conserve, and they may just do it, despite pressure from even their own kind outside to do otherwise. The most effective way to help remains eco-tourism, and individual initiatives. Since the only reliable eco-guides are in Armenia, and belong to ARMACAS or other eco associations, you will be helping the right people by approaching them first.